The biennial international disability festival AbilityFest, is coming to town again… now for the 7th time. Organized by Ability Foundation, a national disability organization that works for inclusion and rights of all persons with disabilities, AbilityFest is ranked as India’s International Disability Festival and is considered at par with those held at Melbourne, London, Moscow & Munich. “60 Seconds To Fame” – a one minute film competition is the extremely exciting and interesting component of the Fest. With prize money up for grabs for the best three films, the winners are adjudged by film industry stalwarts along with eminent persons with disabilities. And the shortlisted films will be continuously screened throughout the Festival days. 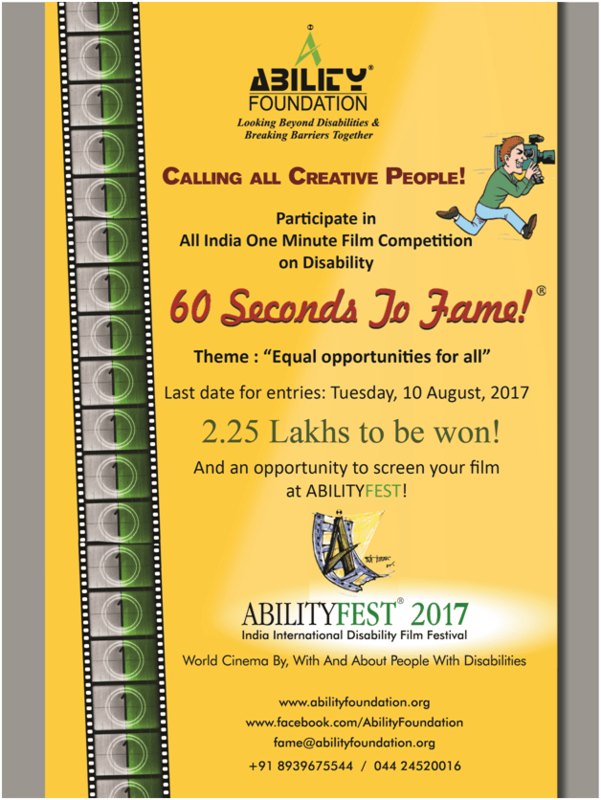 Ability Foundation now invites entries to this all-India one minute film competition on disability “60 Seconds to Fame”. All that is required is a camera, a creative mind and sensitivity towards disability issues – sticking to the theme for this year. The theme for this year is “Equal opportunities for all”. The last date for sending in your entries is 10 August 2017. Movie makers, log on to the website www.abilityfoundation.org for the entry forms, for all information and details.